It took me a little while to get this next blog post written, because we recently moved into our new house!!! It’s been exciting and exhausting, but we’re having fun making the house our home and adding a cozy factor to every room! And now another summer canning season has come and gone. To wrap up the canning series on the blog I’m ending with red beets! I don’t know if you’d agree that I saved the best for last, but I did save the easiest for last. My grandma and I canned 8 quarts of beets in the morning and still had plenty of time to spend the afternoon in Amish country having lunch and shopping with my Mom! The only disclaimer worth mentioning before we jump into the step by step instructions is beets can be a little messy when peeling and if you want to avoid pretty purple stains on your hands you should probably wear form fitting cooking gloves. The stain does wash off easily though and there’s no shame in evidence of good old fashioned work with your hands so I say get a little messy…you’re in the kitchen after all! Also, check out my highlighted Instagram Stories for the play by play documented through a mix of photos and videos! As always, if you’re lucky enough to have access to homegrown beets in the garden pick beets ready for canning, based on size and firmness. If you don’t have a garden, or a grandma with a garden, I like to recommend buying your produce from a local farmer’s market. Add all ingredients to a saucepan and stir to combine. 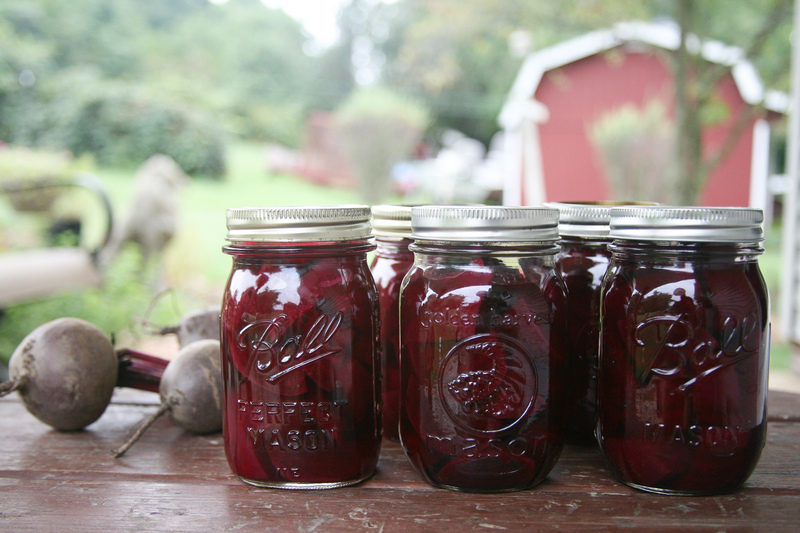 You’ll want to double or triple this recipe based on how many beets you are canning. The recipe as is will probably only fill a couple jars. Add the saucepan to the stove over medium high heat. I apparently forgot to snap a photo of the syrup, but check out my Instagram stories for a visual! Go ahead and add your cold packer filled with water to the stove at this point to start heating up; it takes a little bit of time for all that water to reach a boil. Before you finish prepping the beets, add jars to the oven at 200 degrees and lids in a small saucepan of boiling water on the stove so they can sanitize. You’ll likely be able to peel the beets with your hands. The cooking process makes the skins slide right off! Use a small knife as well if needed and to cut the stem and root off each end of the beet. This will work better than something like a potato peeler. After the beets are peeled, cut them into small chunks and add to a medium sized bowl. Be sure to check on your syrup during this step too. When it starts boiling, you can reduce the heat to low. Carefully remove the jars from the oven and place on a heat resistant surface. Add the beets and then fill each jar to the neck with syrup. We used a funnel to help avoid spills and messes. After all the jars are filled, add lids and rings and tighten well. Add jars to the cold packer insert and carefully lower into the water. Cover and cook in boiling water for 10 minutes. At the end of 10 minutes, use a jar lifter to carefully remove each jar from the cold packer and place on a heat resistant surface to cool completely and ‘pop’ indicating final sealing. Once they are sealed and cooled, use a permanent marker to write the date on the lids. Store in a cool, dark place like a pantry or cellar. Favorite uses for these pickled beets? Eating straight out of the jar! Mixing them in smoothies – I have a screenshot on my phone of a recipe for a pomegranate beet smoothie I want to try soon, yum!! I’ve found a handful of foods and drinks that are good and really good for you are simply an acquired taste. Red wine, coconut water, beets, asparagus, brussel sprouts…these are all things I was not particularly fond of upon first taste. Mainly, you just have to find the right way to prepare them and bring out the great flavor. So if you’re not a fan of beets, but still reading out of pure curiosity…boredom…or in hopes I’ll post another photo of our cute Max dog then maybe consider giving beets another chance! You can reap some pretty awesome health benefits from them too! Just to name a few things 🙂 That’s my spiel! And if beets just aren’t you’re thing, that’s totally fine too! I don’t think my parents will ever become beet fans! Plenty of other goodies out there and a handful of them are in the super foods soup on my list to try next! Stay tuned! This entry was posted in Homemade Alternatives, Recipe Book and tagged beets, canning, canning beets, canning instructions, gardening, healthy alternatives, homegrown, homemade, how to can red beets, pickled beets, red beets, side dishes. Bookmark the permalink.